Ferrari’s relationship with the concepts of “truth” and “fairness” has occasionally been a bit like one of their cars on a set of bald tires: fast and loose. Now, in a lawsuit from a longtime Ferrari salesperson, the company is accused of authorizing the use of devices that allow used Ferraris odometers to be rolled back, sometimes all the way to zero. That, of course, is very illegal. As first reported by the UK’s Daily Mail, Palm Beach-area Ferrari salesman Robert “Bud” Root has accused Ferrari, in a lawsuit against New Country Motor Cars of Palm Beach, of authorizing the use of their Ferrari DEIS Tester diagnostic tool to roll back customer’s odometers so that they can sell their cars for substantially higher money. The lawsuit’s primary focus is a wrongful termination case, since Root claims he was fired both for age discrimination reasons and for whistleblowing on the odometer rollbacks. The nature of the Ferrari DEIS Tester itself suggests that any actions undertaken using the DEIS Tester tool was not simply the choice of the local dealership, Ferrari of Palm Beach, because each use of the tool requires online authorization from Ferrari. In other words, this was systemic, not isolated. We’ve reached out to Ferrari for comment, and will update this story as soon as we get a response. Each time the Deis Tester device is utilized on a Ferrari vehicle, authorization is obtained from the Ferrari entities via a wireless network connection. During the process, vehicle diagnostics and procedures performed with the Deis Tester device are automatically uploaded to a Ferrari database. 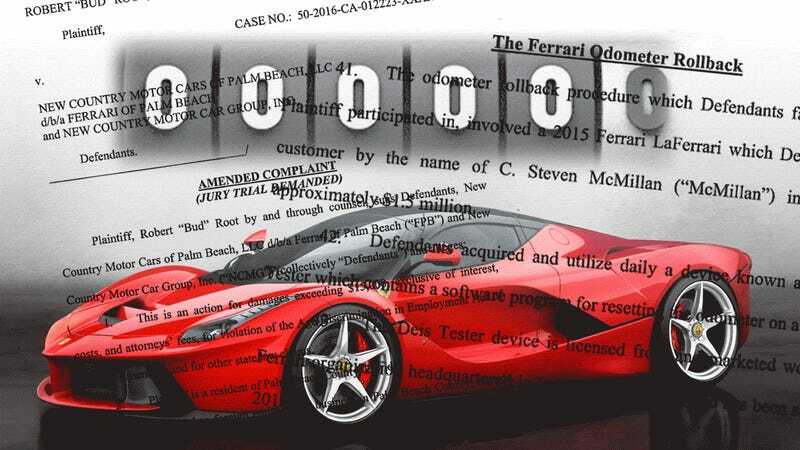 The specific instance of odometer rollback referenced in the lawsuit involves the 2015 Ferrari LaFerrari owned by C. Stephen McMillian, a retired CEO of the large food conglomerate Sara Lee. 51. On or about October 22, 2015, one of Defendants’ technicians utilized the Deis Tester device to reset the odometer on McMillan’s 2015 Ferrari LaFerrari to “0.” McMillan paid the technician cash to perform this operation. The Ferrari entities were aware of the operation because the technician had to obtain logon information from Ferrari N.A. to use the device and because the technician was on the phone with Ferrari N.A. during the operation. Defendants authorized the technician to take the Deis Tester device to the customer’s premises to use on the vehicle. According to a footnote in the lawsuit, the clandestine odometer rollback of the LaFerrari hypercar increased its value over $1 million. On or about October 23, 2015, Youmans was advised by a different technician, who spotted revelatory data on the Deis tester, that the subject technician had performed the odometer rollback on the LaFerrari. Youmans immediately confronted the subject technician, who attempted to show Youmans excerpts from the Ferrari manual which state unambiguously that the rollback is authorized under the circumstances in which it was done on McMillan’s vehicle. Youmans refused to listen, and swore at the technician. Youmans learned during this confrontation that Plaintiff had once spoken to the customer about the Deis Tester device and its odometer rollback capabilities. 54. Youmans knew that responsibility for this illegal incident rested with the customer who requested and paid for it, the technician who performed it, the Defendant dealership which authorized the technician to use the device off premises, the Ferrari entities which published a manual seemingly approving the rollback procedure, and most importantly with Youmans who was supposed to supervise the employees and prevent illegal conduct. The complaint goes on to state that the odometer rollback provided the ideal reason for Youmans to fire Root, allegedly due to his age. According to the lawsuit, Youmans wanted to attract a younger clientele, and wanted to replace Root with his 32-year old girlfriend, Noelle Miskulin, which he did. Since we’re a car enthusiast blog as opposed to a wrongful termination-enthusiast blog, let’s focus on the underlying big, red horse in the room: Ferrari allegedly provides its dealers and service centers with a means to, with at the very least implicit factory authorization, alter the odometer readings on any customer’s car. Any sort of odometer tampering is a federal crime, which has resulted in convictions with sentences ranging from 18 months to seven years in prison—the latter being for major defendants in large prosecutions. 46. The Ferrari entities published a written policy manual dating back to at least April 2010 specifically detailing how to perform an odometer rollback and expressly authorizing its use. Upon information and belief, this Ferrari policy was used at the Ferrari factory in Italy as recently as March 2015 to instruct Ferrari technicians how to reset to “0" the odometer on a Ferrari vehicle. Odometer rollbacks to increase the value of used cars have, of course, been known for decades, dating back to when a car salesman with a coathanger and a deft hand could take years and miles off a car’s life. Still, the vast majority of these incidents were completely in the hands of the seller, not the vehicle manufacturer. Are you aware of any instances of odometer tampering on Ferraris, or do you have any information on these allegations? If so email us at tips@jalopnik.com. Not That This Has Anything To Do With The 812 Superfast But What Was The Ugliest Ferrari Ever Made?